Ahead of his headline set at Cuckoo Land this Friday, we arranged to rendezvous at a secret location with Claptone. Tomorrow - Friday 14 September - Claptone headlines Cuckoo Land at Ibiza Rocks HOtel. Making his second and final appearance for the underground pool party this season, the elusive German house DJ has been popping up all over the island in 2018. No wonder. Ibiza is a spiritual and mysterious place. Even when you think you know it all, there's always something new to discover. The island's landscape and architecture are both charming and atmospheric. We sense that these properties pander to Claptone's deposition. After all, he is a man whose true identity is surrounded by mystique and speculation, a phantom who has mastered the dark art of intrigue. Where in the world does rumour better than Ibiza? We were taken to a rocky outcrop overlooking mystic Es Vedrà early one morning, just before dawn. As mist swirled around the base of the towering rock, we had a fleeting candlelit vigil with Claptone. Accompanied by a bowl of paella he had seemingly made himself on a humble a gas-lit stove, we had a mere ten minutes to talk about his upcoming appearance. Your attire of choice clearly has some Venetian influence by way of a 17th Century epidemic thrown in for good mix. If you had to pick an Ibizan tradition to adopt, what would it be? I would like to gaze into the pink-orange sunset every night with my loved ones by my side - a simple yet beautiful tradition, which perfectly represents what I love about this awesome island. We were lucky enough to catch your after sunset at Café Mambo opening earlier this summer - and it was ace! Congratulations on another crazy Ibiza season. When you're playing poolside at Ibiza Rocks Hotel, is there ever the temptation to swap the mask and the gloves for some speedos and a snapback? The mask has been with me longer than I care to remember, welded out of Titan's steel. I could hardly imagine my life without it. Fair enough. You recently released your sophomore album, Fantast - if you had to pick one track with the most Balearic influence, which one would you choose? It would have to be La Esperanza, featuring the lovely voice of Katie Stelmanis. One of the most adventurous tracks in the Claptone discography. Overtime it has grown to represent my adoration for Ibiza and Spanish culture in general. It certainly has a fitting name. Aside from the clubs, where in Ibiza gives you a sense of wonderment? Over the many years that I have been visiting Ibiza, I have come to form a special connection with the locals who call this place home, long before I showed up with my beats and bass. In particular, this one elderly couple who reside in a modest, coastal bungalow. They make their living selling bespoke jewellery and clothing, made only from materials indigenous to the Balearic Isles. On occasion, they allow me to walk their dogs, tend to their impressive garden and wolf down as much paella as I can handle, of course. As busy as I may be, I always make time to visit Maria and Jordi. Lovely people. Your calling card is as much theatrical performance, as it DJing. With various parties adopting immersive theatre on the dance floor and with Ibiza having long invested in big production, where do you see things headed, looking into your crystal ball? I do my best not to dwell on the past nor to dream endlessly into the uncertain future. I am fully concentrated on the beauty of this present moment. A man of our own sentiment. You've played all over the island this summer, from Amnesia to Eden, Hï to Pacha. But what is it about Ibiza Rocks Hotel that makes it a unique place to play? What makes Ibiza Rocks Hotel special is its rich history in music. It's amazing to see who stayed there and played there over the years. I have some special treats prepared, just for this occasion. "Cuckoo Land" is defined as a state of absurdity, over-optimistic fantasy or unrealistic state of perfection - we can see why the party is a good fit! It begs the question, what does a shapeshifting DJ/producer with a magician's powers do in his ideal downtime? I am deep into the world of chess at the moment - gentleman's sport, where even the strongest of beings are toppled by one, boldly conscious mind. Ahh, ever the strategist, eh. Describe what our audience can expect at Cuckoo Land on 14th September in the eloquent manner as only you can poeticise. Awaiting my lovely listeners is a spellbinding experience, a land of borderless love - a dream world filled with ever-growing energy. Sounds like a hoot! We'll be there - front, centre. Claptone plays the penultimate Cuckoo Land of the season tomorrow, alongside Crazy P Soundsystem, Raffa FL, Jamie Roy and Dan Seaman. 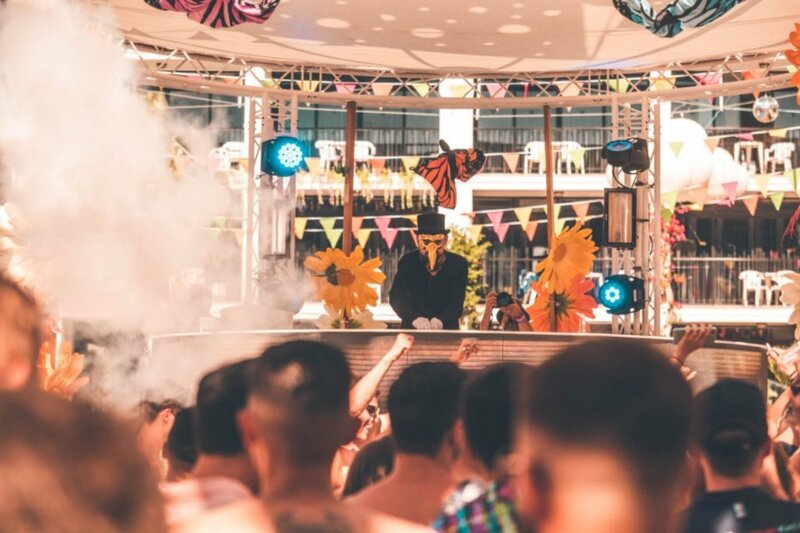 With only two more Friday parties at Ibiza Rocks this summer, make sure you get down to see the masked one and friends send you to cloud cuckoo land. Tickets and additional information can be found below.